Foodborne diseases are caused by pathogenic bacteria, viruses, and parasites. Mold and yeast are generally considered spoilage organisms as they cause undesirable changes to the appearance, texture, smell, and taste of the product. However, some instances of mold growth on food represent food safety threats. Determining the difference between when food with mold growth should be discarded, or when the damaged portion can be removed and the rest of the food consumed, is the challenge. Although there is still a lack of information regarding the food safety risks of mold growth on prepared foods, recommendations have become more conservative over time. Below is a summary of how to handle different products. The specific food safety risk posed by mold growth varies by product. Mold is generally considered a spoilage organism, but consumption of high levels of mold on food by individuals with compromised immune systems (the elderly, infants and young children, and those with some chronic illnesses) has gained increasing concern. Sometimes, mycotoxins are the problem. These are toxins secreted by mold and have mostly been an issue on grains and nuts—corn, wheat, peanuts, etc. However, the concern regarding mycotoxin formation on prepared foods has led to more conservative recommendations on how mold spoilage should be handled. Mycotoxins are often heat stable, meaning that they will not be destroyed by cooking. Determining the specific food safety risk associated with mold growth in a given product is essential in determining what to do with the food. The short answer: Throw it out. This recommendation is based on the food safety issues that the mold causes, rather than just the presence of the mold itself. Some molds will digest the acid in the canned product which increases the pH. For canned foods that rely on acid to control the growth of Clostridium botulinum spores and prevent botulism, increasing the pH can be a major safety concern. Additionally, mold growth can be an indication of incorrect heat processing. Most molds, but not all, will not grow due to the low oxygen environment in canned foods. 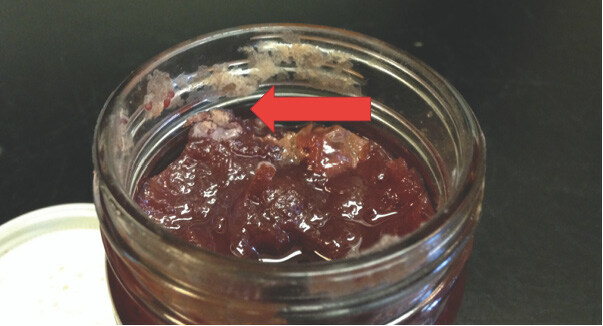 Mold growth can indicate a poor vacuum, a weak seal, contamination along the jar rim, too little headspace, or under-processing. 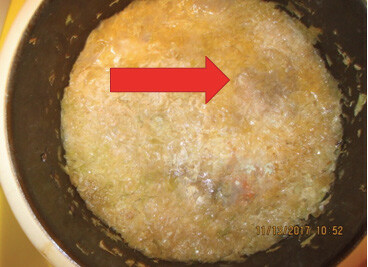 Mold formation in the top of home-canned food. How can you avoid mold growth in your canned foods? Kitchen sanitation and ingredient quality are two factors. Mold spores are often airborne and spoilage may occur sporadically, but maintaining a clean work space and food contact surfaces helps to control contamination. The question of using ingredients—raw fruits and vegetables—with visible mold growth may also arise. Cutting off damaged portions (small lesions and spots) and using the produce for processing has been a good way to utilize lower quality fruits and vegetables. Overly ripe or damaged produce may suffer from the same issue as above. As acids are converted to sugars, the pH increases. Therefore, you should follow a current recipe from a reliable source (USDA, National Center for Home Food Preservation, OSU Extension fact sheets) which will indicate if acidification is needed for products, like tomato-based canned foods, in order to control pH. Additionally, recipes from reliable sources will suggest water bath processing canned foods even after hot-filling since it has been shown to inactivate heat resistant molds. Patulin: A toxin produced by some molds associated with rotted apples. The use of spoiled apples in processed products is particularly noteworthy. Apples with core rot or spoiled by blue-green molds have been associated with patulin, a mycotoxin, in apple juice and cider. Patulin does not cause symptoms of acute illness, but long-term exposure can result in chronic diseases, notably cancer. Heat treatments, like pasteurization and canning, do not sufficiently decrease patulin concentrations. Spoiled apples should be discarded unless the final product will be fermented into hard cider or apple cider vinegar. The yeast fermentation decreases patulin activity. The short answer: Remove the molded portion and use the rest of the product. Sauerkraut and pickle ferments can sometimes sprout mold and yeast growth on the surface of the product. Mold, in particular, grows best in the high-oxygen environment near the surface. For this reason, it is suggested that the vegetables are submerged below the surface of the salt brine to limit oxygen availability and prevent mold growth. If kahm yeast or mold form on the surface, remove quickly but be warned: the spoilage microbes may come back since you are unlikely to remove every cell. You are at a greater risk for losing the fermentation if the spoilage occurs at the beginning of the fermentation process rather than at the end. Once you’ve removed the mold or yeast, consider heat processing, freezing, or consuming quickly before spoilage occurs. Mold formation in the top of home-fermented sauerkraut. Kahm Yeast: Scum or film of white yeast that sometimes forms at the top of the fermentation vessel. Some cheeses and dried meats utilize mold as part of their normal fermentation and development. As such, mold-ripened products (e.g. Brie cheese) are safe to consume. However, spoilage molds on soft cheeses that are not a part of manufacturing (e.g. blue mold growing on feta) should be discarded. If spoilage molds are found growing on hard cheeses (like cheddar), hard meats (like dry-cured salami), and firm vegetables (like cabbage, carrots, and peppers), then the affected portion can be cut off and the rest of the product consumed. The goal is to remove the mold itself—a mold filament is called a hypha and can penetrate through the surface of softer products—as well as eliminate any food that may have been contaminated with mycotoxin. The hard surfaces of these products limits diffusion. Be generous in determining how much of the affected portion to remove—cut at least 1 inch outside of where the mold is growing in order to remove hyphae which may not be visible. Mold removal from the surface of hard cheese. Mold growth on beverages can lead to mycotoxin formation which diffuses through the product. The toxin cannot be eliminated by simply removing the mold and surrounding product, in direct contrast, for example, to hard cheeses. Mold growth can occur when opened juice is left too long in the refrigerator, when coffee has been left out, or in canned juices due to growth of heat-resistant molds. While relatively little data exists on the subject, the potential for mycotoxin secretion has been enough to justify the recommendation to discard products. Containers containing the spoiled food can be washed with warm water and soap and re-used. The short answer: It depends, but usually throw it out. If you purchase a commercially produced food which you find spoiled by mold before the date label, return the food to the grocer or notify the manufacturer. Most facilities will refund or replace the spoiled product and can use the information to improve their product’s quality. If mold grows on a food you prepare at home, current guidance from the USDA suggests discarding the food. This may differ from previous wisdom that suggested simply cutting off the damaged portion and consuming. However, mold can grow beneath the surface of food and, in some cases, can cause allergic reactions, respiratory problems, and illnesses due to mycotoxin production. To prevent having to waste food in the future, consume within 3 to 4 days after preparation, or freeze. Black, D., and J.T. Barach. Canned Foods: Principles of Thermal Process Control, Acidification, and Container Closure Evaluation. 8th ed. Grocery Manufacturers Association Science and Education Foundation. ISBN 978-0-937774-23-6, 2015. Morales, H., S. Marín, A. Ramos, V. Sanchis. Influence of post-harvest technologies applied during cold storage of apples in Penicillium expansum growth and patulin accumulation: A review. Food Control, 21: 953–962, 2010. United States Department of Agriculture. Molds on Food: Are They Dangerous? Food Safety Inspection Service, 2013.